In case you weren’t already inundated with payment options, LG apparently thinks you could use one more. A new leak suggests that LG is ready to enter the payments world, but unlike its biggest competitors Apple, Google, and Samsung, LG will not be using smartphone technology to power your payments. Instead, the company is making a smart card—much like the big busts released by Coin, Plastc, and Stratos. At first glance, LG’s unreleased smart card doesn’t have any special features that we haven’t already seen in others. And it sure as hell doesn’t seem any easier than Apple Pay, Samsung Pay, Chase Pay, Google Pay, or any of the other Pay products already out there. The problem with these new payment options is they’re never easier than just swiping a card. Right now, the choice of whether to go One-Card-To-Rule-Them-All or just cramming it all that functionality inside a smartphone is like picking between two equally painful ways of getting hit in the face. Either way, you lose. 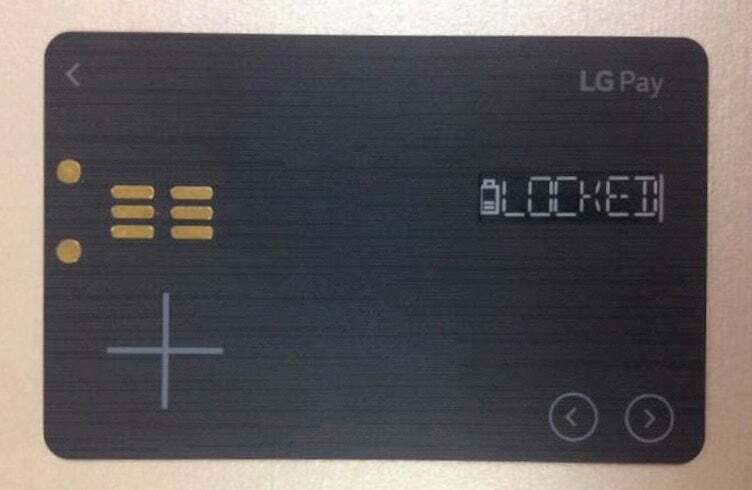 The leaked photo suggests that the product will be called the LG White Card. Three big problems here: One, the card is clearly black and the name makes no sense; two, that is a battery icon on that small, low-powered digital display; and three, that’s a charging connector on the far left, showing strong evidence that you will, indeed, need to charge this card. We have no idea how long or how often you’ll have to charge it, but I already have to charge a bunch of things everyday—phone, watch, laptop, tablet, etc—and I do not want to add “credit card” to the list. But I know what LG is thinking here. When it comes to smart cards, you either make them rechargeable or create a display-free card that can last about a year or two. Stratos wonderfully demonstrated that the latter doesn’t work too well because in order to stretch that battery, you need to also bake in a tap-to-wake feature to conserve energy. Good luck explaining that process drunkenly to a bartender when you try to settle up for the evening. So maybe charging is the lesser of two evils. At least one benefit of LG’s plan is the White Card may stand alone from a smartphone, so you don’t need a Bluetooth connection. That’s a big +1 for convenience and security, but it reportedly doesn’t work with new chip readers, which is a bummer. Even so, almost every single smart card has shown that they just don’t work; Or at most, fail to deliver the promise of a hassle-free, plastic-free existence. Mobile payments have also failed when it comes to annihilating the bulk in your back pocket with even the best of them—Samsung Pay—still not being a viable means for everyday shopping. I’d love to be wrong. I’d love for LG Pay to crack the payments enigma and seamlessly integrate into my life. But the half-dozen or so companies that have tried the very same thing haven’t had much success. LG’s plan for mobile payments, even if backed by a bigger company, doesn’t seem much better.